Q:What about your packages9 What can you do for me if the goods damaged when i open the container9 A:We use sealed Plywood with iron pallets which is stronger and durable. Q:Can you provide samples for quality testing9 A:Yes, the sample is available,but normally clients will be charge the express cost. Q:How long is the Quality Guarantee Time and after sales service9 A: 10 years Quality Guarantee,you can call us or e-mail to us ,we will reply you within 24 hours. For the convenience of installation, we will provide detailed drawing and photos for guidance. If there isn't what you like, you can tell us your requirement, we can customize and provide drawings for your check. The first layer is film, the second is carton or woven bag, the third is carton or plywood case. 6 YRS Foshan Jianuo Decorative Hardware Ltd.
4 YRS Shenzhen Tenda Hardware Co., Ltd.
You only need to send us your projects Plan drawings, then we will make the solutions for you . Q:How long is your delivery time9 A:About 30 days after shop drawing confirmed. Q:What is your terms of payment 9 A:T/T, 50% deposit before production, 50% balance before shipping. 2. 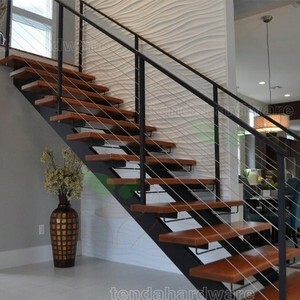 Detailed installation drawing and instruction of the glass railing will be provided. \ 2.What is your advantage9 1/ Most of our products are customized as your requirement. s is more suitable for indoors, far away from oceans. , Limited Our main export markets are Australia, North America and Western Europe. 3: After production, install products in factory, check surface of products, and sizes of products. The first layer is film, the second is carton or woven bag, the third is carton or plywood case. 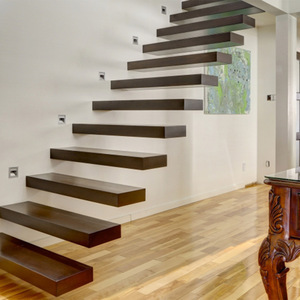 Material This stairs is composed of mild steel stair stringer and wood treads. With the instructions / guide together with the stairs, most of men users can assemble the stairs himself. 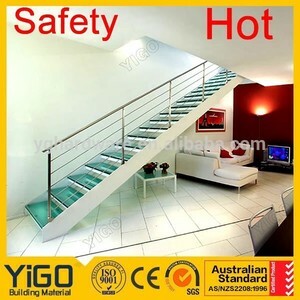 To help you upstairs step by step on stairs we made is what we untiringly aspire after. 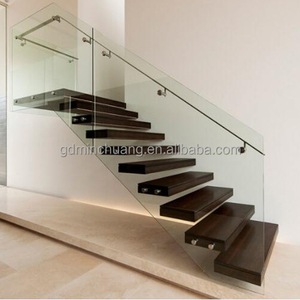 DAIYA Curved stair stringers with double u channel beam glass railing Specifications Size Floor height customized as your job site Width 700-1800mm Material Beam stainless steel / carbon steel Tread laminated glass / solid wood / Metal Handrail stainless steel / carbon steel / solid wood / PVC Baluster stainless steel / carbon steel / aluminum Rod stainless steel / carbon steel / aluminum Component & Size (mm) Beam Dia 114mm*6mm thickness inside support post; dia 120mm*6mm outside support post Tread thickness 10+1.52+10mm or 12+1.52+12mm for glass tread; 30 - 40mm for solid wood tread Handrail or 50*50mm Baluster or 50*50mm Rod/Wire Wire : ; Rod : Glass 10 ,12,15mm thickness 6+1.52+6mm/8+1.52+8mm laminated glass Finish Stainless steel mirror/ satin/ brushed Carbon steel hot galvanizing/powder coating/painting Aluminum powder coating/ galvanized/ oxidize Solid wood painted Glass Clear/frosted/tinted Detailed Images Different type for optional Wooden Tread Curved Staircase Detail Picture : Below all the real feedback picture from client. Email us to send you the feedback email and pictre recently for reference. 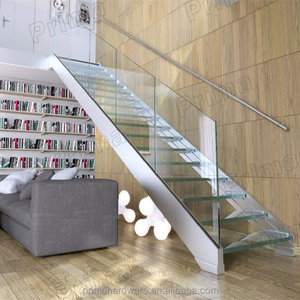 Glass Tread Curved Staircase: Drawing : We will free to make Drawing for you as below: Spiral Staircase Drawings: Curved Staircase Drawing reference: Packaging & Shipping Package of DAIYA Staircase & Rialing: For stair stringer / beam: PE foam & hard paper & woven bag For Treads support, treads: PE foam & hard paper & plywood box For balustrade / handrail: PE foam & hard paper & woven bag & plywood box Package Size: as per the stair sizes Our sevice: 1. Your inquiry related to our products or prices will be replied in 24hours 2. Well-trained and experienced staffs to answer all your enquires in fluent English 3. Protection of your sales area, ideas of design and all your private information 4. If you want to more details and catalog, etc ,feel free to contact us . 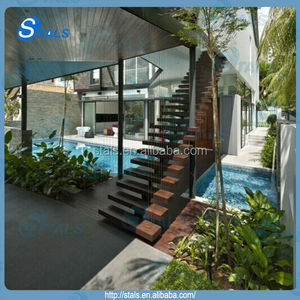 1 YRS Alland Building Materials (Shenzhen) Co., Ltd.
2 YRS Foshan Hereditary Hardware Products Co., Ltd.
Full range and varity products about the home decoration B. small quantity you can choose by air B. less than one container you can choose LCL shippment by sea C.
Alibaba.com offers 16,396 wooden stair stringers products. 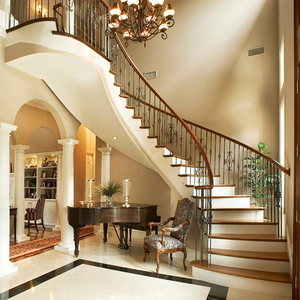 About 21% of these are stairs, 1% are wood flooring. A wide variety of wooden stair stringers options are available to you, such as indoor, outdoor. You can also choose from solid wood, steel-wood, and natural stone. As well as from e0, e1. And whether wooden stair stringers is straight stairs, arc stairs, or spiral stairs. There are 16,396 wooden stair stringers suppliers, mainly located in Asia. 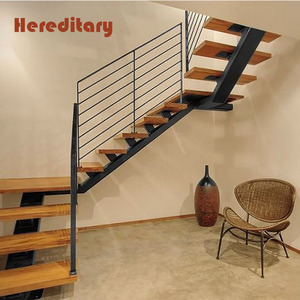 The top supplying country is China (Mainland), which supply 100% of wooden stair stringers respectively. Wooden stair stringers products are most popular in North America, Oceania, and Central America. You can ensure product safety by selecting from certified suppliers, including 1,691 with Other, 76 with ISO9001, and 5 with FSC certification.